What if a symphony soloist connected with your community? And left a richer cultural connection? Orchestrating Community is the brainchild of Grammy-Nominated, instrumental innovator Deborah Henson-Conant. Her award-winning compositions for orchestra received a Grammy-Nomination for best classical crossover album. Her TEDx talk tells about the invention of the instrument she plays, which is named after her: the “DHC” electric harp. She combines virtuosity with community celebration in shows that are passionate, funny, breathtaking, intimate and deeply musical. And she brings members of the community on stage to play with her. When I was invited to play with Symphony Tacoma, Pat Wooster, the symphony’s harpist asked if I could also present a workshop for her students. I said, “What if I taught them to play a piece that they could come and play on stage with the orchestra?” We ran the idea past the symphony administration and everyone loved it. Then we opened up participation to all harpists in the community, to get a broad age-range of apprentice soloists so audience-members could really ‘see’ themselves performing on stage. 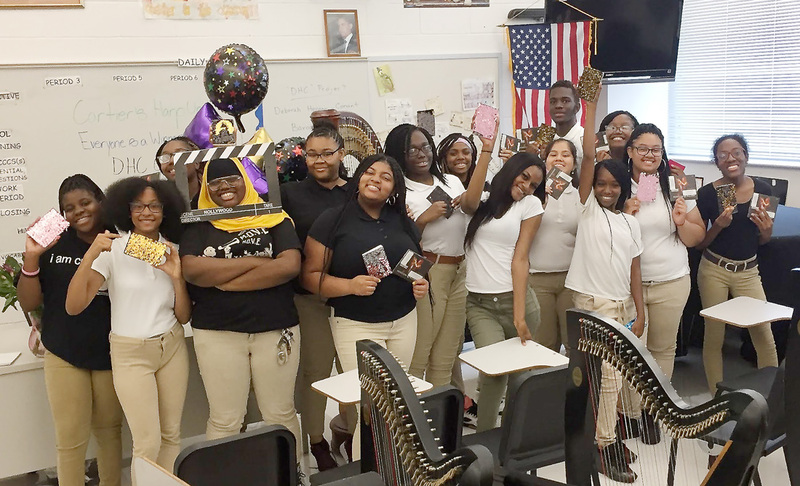 To help build the audience and support for the apprentice soloists, I taught them how to write press releases and they each reached out to invite the press, friends, family and neighbors from their own communities – so now different local communities could see themselves represented on stage. We added a harp petting zoo after the show to create even more interaction. The show was sold out, the apprentice soloist became known in their own communities and people came to the show to see ‘their’ local players who wouldn’t have normally attended. This was no amateur ‘recital.’ The soloists got serious performance coaching from the principle soloist and because of the way the music is constructed, even die-hard symphony goers loved the virtuosity of the principle soloist backed by the enthusiasm and talent of the apprentice soloists and the symphony. Deborah Henson-Conant tells stories with music using a custom-built carbon fibre electric body-harp that she wears via a harness. Her music combines elements of Blues, Jazz, Latin, Classical and Musical Theater and innovative strumming, percussive and bending effects she uses along with a looper pedal. She’s presented her original works at the Kennedy Center “Imagination Celebration” and Boston “Ideas” Festival and debuted her One-Woman Musicals at the Central Square Theater in Cambridge, MA and the Regent Theatre in Arlington, MA. BOOKING INQUIRIES: Email info@hipharp.com and include the preferred date, location and how you heard about Deborah Henson-Conant. The Directing Soloists work with Henson-Conant to develop the works they’ll be playing. These soloists have a long background of performing, teaching and leading ensembles. 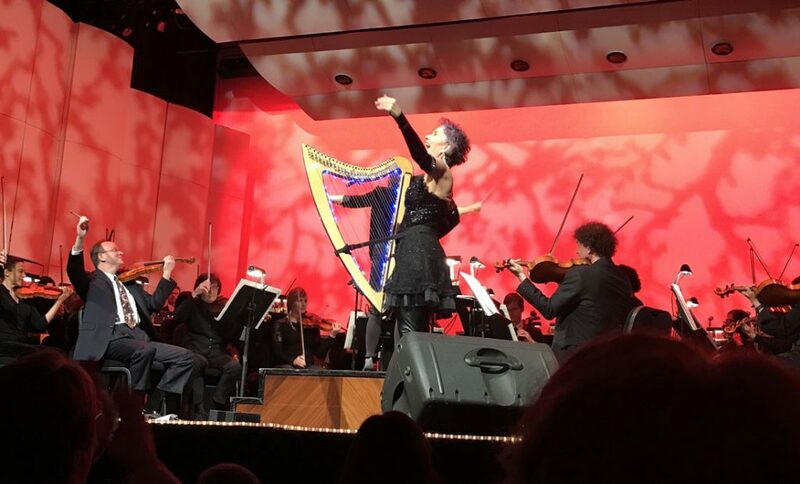 the program was opened up to the students at the Cicely Tyson School for the Performing Arts, when the entire harp department of 35 students joined their teacher, soloist Robbin Gordon-Cartier in a project that brought them on stage with a symphony and creating community with the audience. BOOKING INQUIRIES: To book Robbin Gordon-Cartier contact xxxxxxxx and include the preferred date, ensemble and how you heard about DHC. Shelley is deeply passionate about engaging more people in harp playing and listening to harp music, both through community engagement harp workshops, and through approachable performances. 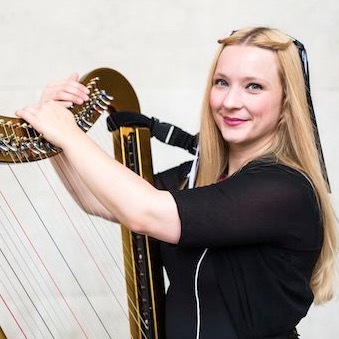 This desire has inspired her to create regular family centered harp events including the annual family harp weekend at the National Botanic Garden of Wales where she is the resident harpist. 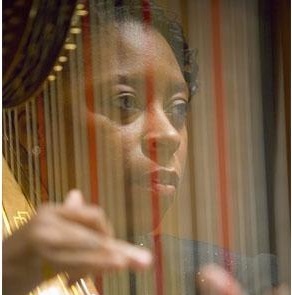 Her core ensemble involved in ‘Orchestrating Communities’, Dynamic Harps, was founded in 2013. 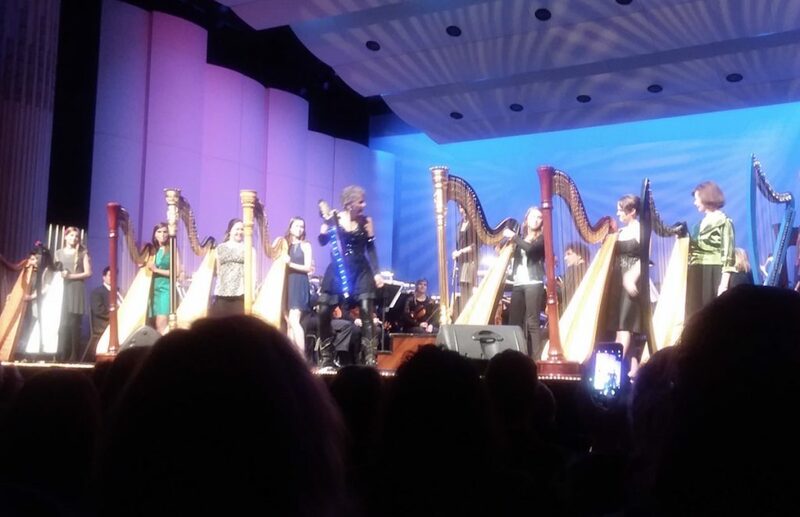 Shelley’s “Orchestrating Community” concerts can include extended residencies including her “Harpist for a Day” program and her harpist-mentor project, where “Dynamic Harps” come along to events and act as student-mentors for the additional community members who join the ensemble. BOOKING INQUIRIES: To contact Shelley and book performances or residencies, email: info “at” HarpWales.com – and include the preferred date, ensemble and how you heard about DHC. The “Orchestrating Community” music has been premiered with ensembles like Boston Pops, Buffalo Philharmonic, National Symphony Orchestra, Baltimore Symphony, Grand Rapids Symphony, Jacksonville Symphony, Austin Symphony, Prague Radio Orchestra and scores of other U.S. major and regional symphonies. Most of these works are also arranged for 8-piece chamber ensemble (String Quartet, Bass, Percussion, Flute & Clarinet). Combining performance coaching, creative entrepreneurship and live performance. The residency combines online and off-line elements. This program works by empowering local performers to perform with ease and presence, to reach out to their communities to invite them to show, and to create programs for outreach. The Associate Soloists work with creator/composer and Grammy-Nominated orchestral soloist Deborah Henson-Conant to develop their ability to work with others. All soloists in each program – Associate and Apprentice soloists – in the program works with DHC to learn the music and develop their ability to really be present on stage. The AUDIENCE experience is expanded. Not only do they get the experience of a great soloist, but they get to see rising talents as well, presented in a way that elevates everyone. The NEW AUDIENCES come, not to be ‘educated’, ‘elevated’ or ‘cultured’ – although that happens to anyone with a new experience – but because there are musicians on stage who represent them and their communities. They work with the marketing department, creating videos specifically for your audience – to use in social media. In addition to performance, publicity & ensemble training, each Associate Soloist develops a “TEDx-type” talk to share as part of the outreach to your audience. BOOKING INQUIRIES: Email info@hipharp.com and include the preferred date(s), length of residency, the departments you’d like to serve (ex: music, theater, dance, women’s studies, entrepreneurship, etc.) and any performance or speaker events you’d like to consider. All residencies are collaborative, so you’ll be able to build the residency together with DHC – this information is just to give us a sense of what part of your audience, clients, faculty, members or students you’d like to serve.